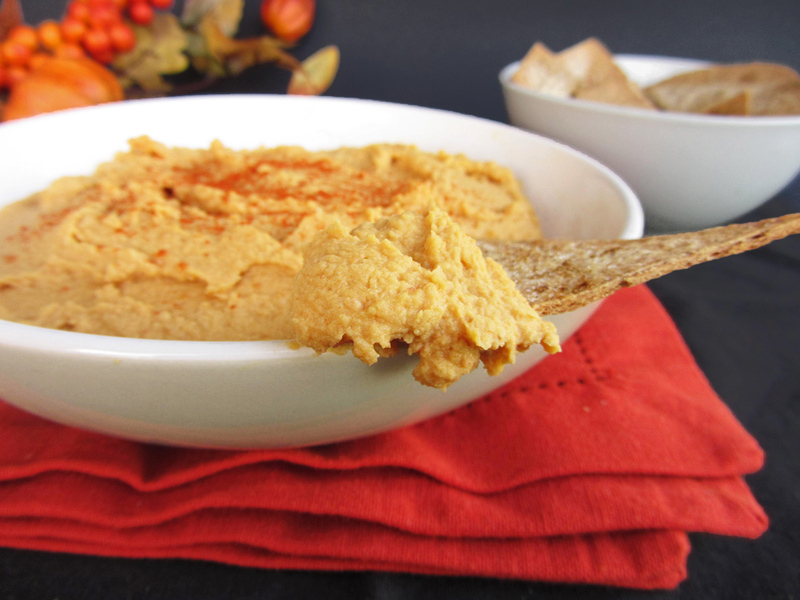 Recipe Round Up: The Pumpkin Edition! Here’s our second recipe round-up! It seems almost negligent to NOT include pumpkin recipes this October, so I have scoured the internet for sweet AND savory recipes using pumpkin for you! These are all VIBRANCE approved – meaning made with whole foods, low glycemic, gluten-free, dairy-free (or easily altered to become dairy-free) and paleo friendly. Click on each picture to be taken to the recipe. Enjoy! For special recipes tried, tested and created in the VIBRANCE kitchen, be sure to stay connected by signing up for our monthly newsletter by clicking the button below! Heat water or stock over medium high heat. Once warm, add “Better than Chicken Broth, stirring it in to dissolve. Add poultry seasoning, chopped chicken, and potatoes. Reduce heat to medium and simmer for 10 minutes, or until chicken becomes opaque and potatoes half-cooked. Add remaining veggies, coconut milk, and pepper. Stir until well blended and simmer until potatoes and carrots are tender – about 5-10 more minutes. Mix coconut milk with Better than Bouillon until well combined. Add chicken, carrots, celery, red pepper, peas, black pepper, poultry seasoning and coconut milk to a gallon freezer bag. Label and freeze. Day Of: Make sure you have 3 small waxy potatoes available. Remove ingredients from bag, add potatoes, and simmer on med-low until chicken and potatoes are cooked through, about 30 minutes. My appetite for tart flavors began early in my pregnancy and has lasted throughout. 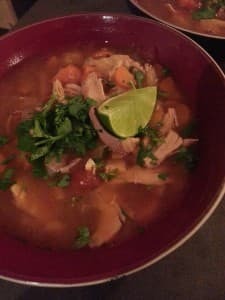 This soup is absolutely fantastic when I’m in the mood for something fresh and tart, yet it is hearty enough to stand alone as a main course. This will be great cool weather fare! Note: although it is not traditional to have veggies in this soup in Greece, I always put a couple in, simply because we all need more vehicles for veggies and they taste good! I have carrot and potato on the ingredient list here, but minced celery and maybe a smallish zucchini are also quite delightful, especially if made in the summer or early autumn when there is less desire for heavier soups. You can blend the veggies into the broth for picky children (or adults!). In a large bowl, combine the meat, minced onion, garlic, rice, 3 tablespoons chopped parsley, the mint, oregano, salt and pepper, and 1 egg, slightly beaten. Knead for a few minutes, then shape into walnut-sized meatballs and set aside. In a soup pot, bring the water or stock to boil and add the meatballs. Cook for 20 minutes while chopping veggies. Add chopped onion, celery, carrot, zucchini and potato. Add salt and pepper to taste. Lower the heat and gently simmer, covered, for 20-25 minutes (until the vegetables are tender), then remove from the heat. If you need to puree the stock to disquise veggies, remove 1 cup of broth and meatballs and blend remaining stock until smooth. To prepare avgolemono: beat the two remaining eggs for 2 minutes. While beating all the while, gradually add the lemon juice. Then add 1 cup of the reserved hot broth in a slow, steady stream (ladle), beating steadily, until nearly all the hot liquid has been added. Add the egg/stock mixture back to the soup pot and heat, being careful not to let it boil, stirring, until thickened. 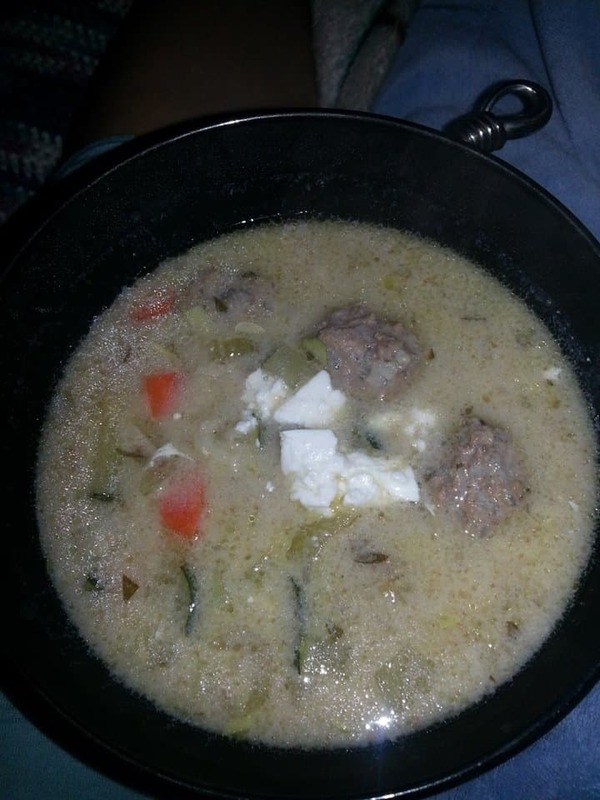 If tolerable to your digestion, serve this with feta cheese on the side- goes great with the little meatballs. I use sheep milk feta, which is easier on my system than cow-based dairy. Bone broth has been used in most cultures as a restorative and healing food. It is used to heal the sick, mend injuries, restore strength and promote health. As the values of processing became associated with purity in the early 20th century America potent medicinal foods such as organ meats and bone broth became passé. There are some schools of nutritional thought that point to the loss of “scraps” from the diet as contributors to disease and tooth decay that are the norm in modern culture. 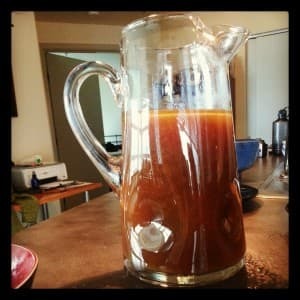 After much experimentation, I have found a bone broth of my own making that I am very excited about. It is dark, rich, and flavorful. It includes ingredients long forgotten but highly valuable in healing. And, it’s very easy to make, requiring little prep or clean-up. OPTIONAL: Roast bones in 400 degree oven until browned – 5-10 minutes. This roasting will add depth of flavor to the broth. 1) Crush garlic and set aside to allow allicin to form. 2) Place veggies and bones into slowcooker pot. Add herbs, sea vegetables and spices. 3) Cover with water and vinegar. 4) Set slow cooker on low for 24-36 hours. 5) Strain broth, discarding vegetables. Bones may be saved and reused if desired. Sometimes I will go to an Asian grocery store or find a new vegetable that I have never heard of. Sometimes (especially if in a small Asian Market) I don’t even have the english name for it. I take it home and google the name until I get a sense of how to use it. 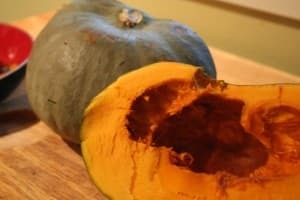 A few weeks ago, I came across a Blue Kuri Squash. I had never heard the name before, but it looked a little familiar – one of those squashes that sits in the produce area and gets passed over due to it’s weirdness or, if lucky enough to be taken home, sits upon the dining room table as part of a holiday setting only to be thrown out when it gets wrinkly and soft. Such a sad squash situation! As you can see, the humble Blue Kuri Squash is actually quite stunning when sliced open. Unlike many winter squashes, it’s skin is thin enough that it can be eaten; this saves time in the kitchen since you do not have to peel it before or after cooking. Kuri squash is a relative of Kabocha squash, which I first discovered when learning about Macrobiotic Diets at the Institute for Integrative Nutrition. 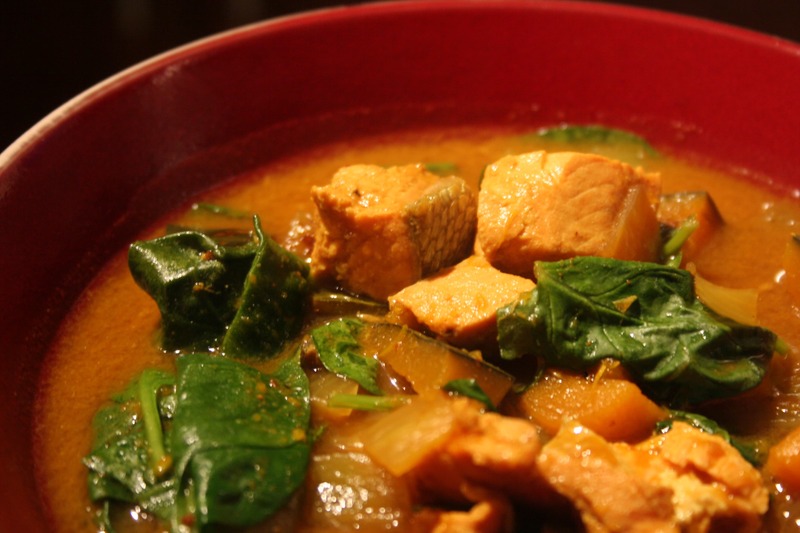 Like kabocha, it has a lovely sweet flesh that counters the bitterness of curry. It can be used instead of butternut or acorn squash in risotto, pureéd soups, or roasted in the oven and enjoyed with salt and pepper or even cinnamon and maple syrup! Like many winter vegetables, Blue Kuri squash is rich in beta-carotene – a perfect winter food for strong vision in the dark months. After spending some time on Google and assessing what I had in my kitchen, I created the following recipe. It is adapted from one here (the Split Pea). The sweet squash counters the bitter curry well and the salmon plays a mild role in this soup, yet it’s weight adds heartiness to the meal. The spinach adds color and makes it easy to get a serving of greens in (kale would go well here, too). Heat the oil in a large enamel cast iron pot, or dutch oven. Place the onions, garlic, and ginger in the oil and sauté for about 3-5 minutes. Add the curry paste and curry powder, stir to combine and sauté for another minute. Add the coconut milk, chicken broth, fish sauce, chili sauce, Kuri squash, and stir. Bring everything to a boil, lower the temperature and simmer for about 10- 20 minutes, or until the squash has cooked through. Add the salmon, honey and salt. Simmer for 5 minutes or until the salmon has cooked through (do not cook too long or the salmon will be tough and the squash will be mushy). Taste and adjust seasoning as needed (it needs to have a good salty, sweet, tart, and spicy balance). Serve with chopped cilantro and scallion, along with lime wedges.